My favorite movies of the year were almost exclusively dramas, whether the subject matter was political (e.g., Shanghai and Chakravyuh), social (e.g., Ishaqzaade and Talaash), or personal (e.g., Cocktail and Patang). English Vinglish — a personal drama about a mother’s quest to regain her self-worth — proved to be one of the years most delightful surprises, thanks to a triumphant return to the big screen by Sridevi. I awarded a perfect four-stars to three movies this year — movies that could not be more different from one another. Supermen of Malegaon is one of the most fun and fascinating documentaries I’ve ever seen. While it never released theatrically in the U.S., the whole movie is available for free with English subtitles on YouTube. Evaluated in a vacuum, Barfi! is a wonderful and heart-wrenching movie. But given director Anurag Basu’s apparent lifting of whole scenes from other films, I have trouble recommending it with a clear conscience. Therefore, I instead recommend the (unfortunately-titled) Jism 2, a movie so bad, it’s good. There’s no movie I had more fun watching in 2012. The best film of the year was a meticulously crafted thriller with character development to spare and a magnificent, evocative setting. My best Bollywood movie of 2012 is Kahaani. This is a movie I could watch over and over again. Vidya Balan reaffirms that she’s the most talented actress working in Hindi films at the moment. Her co-star, Parambrata Chatterjee, holds his own alongside her, playing a police officer with a crush that’s doomed to go nowhere. One aspect of Kahaani I particularly appreciate is its positive take on marriage. Balan plays Vidya, a pregnant woman from London searching for her husband, Arnab, who’s gone missing in Kolkata. Everyone tries to tell her that he has probably just run out on her, but she refuses to believe them. She knows in her heart that not only would he never leave their unborn baby, but he wouldn’t leave her, either. So often, we’re confronted with cultural tropes that portray marriage negatively. Husbands are depicted as either incorrigible philanderers or hapless morons barely tolerated by wives who only need them for baby-making and yardwork. Isn’t it more satisfying to see an onscreen marriage in which both partners really know and value each other? That’s what makes Vidya’s search so frustrating and engrossing: there’s real love at stake. This entry was posted in Articles and tagged 2012, Barfi!, Best Bollywood Movies, Bollywood, Chakravyuh, Cocktail, English Vinglish, Hindi, Indian, Ishaqzaade, Jism 2, Kahaani, Movie, Parambrata Chatterjee, Patang, Shanghai, Supermen of Malegoan, Talaash, Vidya Balan on January 1, 2013 by Kathy. Raaz 3 — another sequel that’s not really a sequel — opens in Chicago area theaters on September 7, 2012. The 3D horror film stars Emraan Hashmi and Bipasha Basu. Raaz 3 opens on Friday at the Big Cinemas Golf Glen 5 (2D only) in Niles, AMC South Barrington 30 (3D only) in South Barrington, and Regal Cantera Stadium 17 (2D and 3D) in Warrenville. The film is rated R and has a listed runtime of 2 hrs. 30 min. Read my review of the film here. Despite opening to dismal collections of just $105,865 from seventy-four U.S. theaters, Joker gets a second week at the South Barrington 30 and Cantera 17. For comparison’s sake, the Tamil film Mugamoodi earned $55,501 from just twenty-two screens in its U.S. debut last weekend. Shirin Farhad Ki Toh Nikal Padi gets a third weekend at the South Barrington 30, while Ek Tha Tiger sticks around for a fourth week at all of the above theaters. Other Indian movies playing at the Golf Glen 5 this weekend include Desperate Endeavors (English), Mugamoodi (Tamil), Run Baby Run (Malayalam), and the Telugu films Shirdi Sai and Sudigadu. I’m sad to report that the streaming video service Mela is shutting down on September 15. I updated my article on the best ways to stream Bollywood movies on the iPad to reflect the news. In the days that Mela remains active, I recommend using it to watch the exceptional documentary Supermen of Malegoan. If you’re a masochist, check out the Hindi horror film Ghost, the current leader in the race for my worst Bollywood film of 2012. Other movies I’ve reviewed via Mela include Hate Story, Bumboo, Chaurahen, and The Forest. The Toronto International Film Festival is underway, and this year’s City to City spotlight shines on Mumbai. The great political thriller Shanghai is among the ten films featured in the select program. This entry was posted in Weekly Theater Updates and tagged 2012, 3D, Aiyyaa, AMC South Barrington 30, Big Cinemas Golf Glen 5, Bipasha Basu, Bollywood, Chicago, Desperate Endeavors, Earnings, Ek Tha Tiger, Emraan Hashmi, English, Friday, Hindi, Indian, Joker, Malayalam, Mela, Movie, Mugamoodi, Niles, Raaz 3, Regal Cantera Stadium 17, Run Baby Run, Runtime, September 7, Shanghai, Shirdi Sai, Shirin Farhad Ki Toh Nikal Padi, South Barrington, Sudigadu, Tamil, Telugu, TIFF, Toronto International Film Festival, Trailer, Warrenville on September 6, 2012 by Kathy. Two Hindi films are set to open in the Chicago area on June 15, 2012. The Bollywood comedy Ferrari Ki Sawaari — starring Sharman Joshi and Boman Irani — gets the wider release of the two movies. Ferrari Ki Sawaari opens on Friday at the Regal Gardens Stadium 1-6 in Skokie, Big Cinemas Golf Glen 5 in Niles, AMC South Barrington 30 in South Barrington, and Regal Cantera Stadium 17 in Warrenville. It has a runtime of 2 hrs. 20 min. You can read my review here. The other movie making its theatrical debut this weekend is Patang (“The Kite”), a terrific independent film that started making the festival rounds last year. It stars Seema Biswas and Nawazuddin Siddiqui. Patang opens in Chicago on June 15 at the AMC River East 21 and June 22 at the Golf Glen 5. The film’s website has a complete list of opening dates and locations, which includes theaters in New York, New Jersey, California, and a number of Canadian cities. Given the film’s indie status, it’s only guaranteed one week at each theater (though that may increase if ticket sales are good). Catch it while you can. Patang has a runtime of 92 minutes. Last weekend’s new release, Shanghai, gets a well-deserved second week at the Golf Glen 5, South Barrington 30, and Cantera 17. Rowdy Rathore carries over for a third week at the Golf Glen 5 and South Barrington 30, having earned $654,352 in the U.S. so far. Other Indian films playing at the Golf Glen 5 this weekend include Endhukante Premanta (Telugu) and The King and The Commissioner (Malayalam). This entry was posted in Weekly Theater Updates and tagged 2011, 2012, AMC River East 21, AMC South Barrington 30, Big Cinemas Golf Glen 5, Bollywood, Boman Irani, Chicago, Earnings, Endhukante Premanta, Ferrari Ki Sawaari, Friday, Hindi, Indian, June 15, Malayalam, Movie, Nawazuddin Siddiqui, Niles, Patang, Regal Cantera Stadium 17, Regal Gardens Stadium 1-6, Rowdy Rathore, Runtime, Seema Biswas, Shanghai, Sharman Joshi, Skokie, South Barrington, Telugu, The King and the Commissioner, The Kite, Trailer, Warrenville on June 13, 2012 by Kathy. In the opening scene of Shanghai, an older man tells his nephew he’s worried that the two of them may be in over their heads: the powers they’re dealing with are just too big. Such is the case for all of the main characters in Shanghai, a jaw-dropping thriller. In India’s drive to become a world financial power, the low-income neighborhood of Bharat Nagar is designated as the future home of the International Business Park (IBP), a collection of high-rise office buildings. IBP has the blessings of a pair of local politicians. The residents who will be forcibly relocated have little say. Author and activist Dr. Ahmedhi (Prosenjit Chatterjee) arrives in town with the hope of uniting the residents to oppose IBP. His former student, Shalini (Kalki Koechlin), gets a tip that the doctor’s life is threatened by goons affiliated with the local political party. Ahmedhi goes ahead with his planned rally and is promptly hit by a truck driven by the uncle and nephew — Jaggu (Anant Jog) and Bhaggu (Pitobash), respectively — from the opening scene. The local government sets up what the audience knows is a sham inquiry into Ahmedhi’s “accident.” But the bureaucrat assigned to run the inquiry, Krishnan (Abhay Deol), takes the job seriously and uncovers discrepancies in the official accounts. Shalini demands the truth and confronts Krishnan with irrefutable evidence from an unsavory source: a slimy pornographer named Jogi (Emraan Hashmi). Deol performs admirably as Krishnan, but the role is pretty straightforward. Krishnan is careful with his words, knowing that a promotion surely awaits if he does well in his investigation. It’s hard to become emotionally attached to the character. Because of that, Shanghai belongs to Koechlin and Hashmi. Kalki Koechlin has one of the most expressive faces I’ve ever seen. She elevates staring to an art form. After stellar performances last year in That Girl in Yellow Boots and Zindagi Na Milegi Dobara, and now this star turn in Shanghai, I’m willing to put Koechlin alongside Vidya Balan as the two most talented actors working in India right now. She’s riveting. Until now, I haven’t loved any of Emraan Hashmi’s performances. He’s been good, often playing handsome, lusty characters, but he hasn’t blown me away. Hashmi is spectacular in Shanghai. Jogi is gross, with his stained teeth, grimy clothes, and his slight beer belly. He’s still lusty, but by no means handsome. One of the best moments in Shanghai is when Jogi tilts his head back and grins at Krishnan while standing next to him at a urinal. It’s a smile that’s meant to be charming but comes off as repulsive, especially given the setting. Jogi’s reptilian swagger fades when he realizes how much trouble he’s in. It’s replaced by a barely restrained panic, which Hashmi portrays perfectly. A scene in which Jogi and Shalini navigate Bharat Nagar at night under a police curfew is heart-stopping. As wonderfully plotted as the film is, there were some moments near the end that didn’t work for me. Krishnan has an important conversation with someone in a position of authority, and I wasn’t sure who that person was. In fact, I wasn’t even clear who Krishnan ultimately worked for (thanks to commenter Dallas Dude for clearing things up). Also, the film ends with unnecessary epilogue notes, though the ending scenes had already done more than enough to wrap up the story. Shanghai is something special. It’s a great thriller that doesn’t overstay its welcome, clocking in at under two hours long. That runtime includes two songs which fit smoothly into the story. It’s a nice way to keep uniquely Indian elements in a film with unquestionable international appeal. This entry was posted in Reviews and tagged 2012, 3.5 Stars, Abhay Deol, Anatnt Jog, Bollywood, Emraan Hashmi, Hindi, Indian, Kalki Koechlin, Movie Review, Pitobash, Prosenjit Chatterjee, Runtime, Shanghai on June 8, 2012 by Kathy. 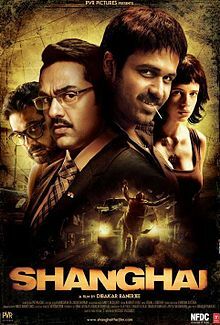 Shanghai is the only new Hindi movie opening in the Chicago area the weekend beginning June 8, 2012, and it looks promising. The thriller stars two of my favorite actors — Kalki Koechlin and Abhay Deol — in a tale of politically motivated murder. Shanghai opens on Friday at the Big Cinemas Golf Glen 5 in Niles, AMC South Barrington 30 in South Barrington, and Regal Cantera Stadium 17 in Warrenville. The film’s website has a full national theater list. Shanghai‘s runtime is 1 hr. 54 min. Read my review here. All three of the above theaters and the Regal Gardens Stadium 1-6 in Skokie carry over Rowdy Rathore for a second week. The action-comedy opened with earnings of $381,784 from 120 U.S. theaters. Other Indian movies playing at the Golf Glen 5 this weekend are the Telugu films Adhinayakudu and Endhukante Premanta. Outside of the theaters, June 8 marks the Mela debut of the March, 2012, release Bumboo. It’s also the day Don 2 becomes available in DVD format at Netflix. This entry was posted in Weekly Theater Updates and tagged 2012, Abhay Deol, Adhinayakudu, AMC South Barrington 30, Big Cinemas Golf Glen 5, Bollywood, Bumboo, Chicago, Don 2, Earnings, Endhukante Premanta, Friday, Hindi, Indian, June 8, Kalki Koechlin, Mela, Movie, Netflix, Niles, Regal Cantera Stadium 17, Regal Gardens Stadium 1-6, Rowdy Rathore, Runtime, Shanghai, Skokie, Telugu, Trailer, Warrenville on June 7, 2012 by Kathy.